Latest Trends in Smart TV. Could Apple Win? The pace of technological change is accelerating, and the ritual of updating your home TV every 5-8 years is getting obsolete. Smart TVs (or connected TVs) are all the rage these days. They bring the whole new world of instant entertainment. Smart TVs are television sets that can retrieve content from the Internet and offer built-in applications for streaming music and movies, apps for social networking, apps for news, weather, sports, games, YouTube and more. In addition to using apps, one of the most appealing factors for tech-savvy consumers is voice activation technology to control TV sets. According to DisplaySearch, a leading provider of reliable information about the display-related industries, connected TVs are forecast to grow to over 123 million shipments in 2014 (at a 30% compound annual growth rate). The market is now developing beyond mature regions like Western Europe and Japan. Emerging markets play a major role in this growth. With the improvements in the broadband infrastructure, the adoption of connected TVs is a natural next step in TV feature innovation. Eastern Europe is expected to grow from 2.5 million connected TVs shipped in 2010 to over 10 million in 2014. In addition to that, 33% of flat panel TVs sold in China in 2013 will have the Internet capability. DisplaySearch also forecasts that the connected TV market will become fragmented and increase in complexity. One group of TV sets is supposed to feature basic video on demand and appeal to consumers who expect television to remain a passive experience. Those who want something more substantial will find interesting other TV sets offering configurable apps, sophisticated search and navigation engines, as well as advanced user interfaces. 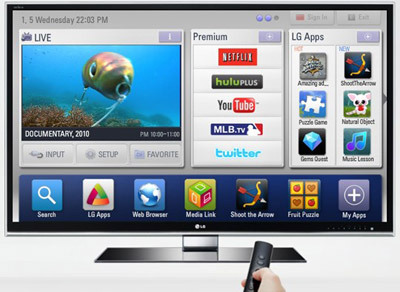 The main contemporary connected TV platforms include Samsung Smart TV, LG Smart TV, Mitsubishi Stream TV, Panasonic Viera Connect, Sony Bravia, Toshiba NetTV, Apple TV, Google TV, TiVo, Liberty Global's Horizon and Yahoo! Connected TV. Samsung, with around 20 million apps downloaded by the end of January 2012, is the segment leader, followed by Panasonic and LG. However, the biggest shake-up in the television industry is going to cause Apple's much-talked-of TV set. It promises to revolutionize television like once the iPad hit the market. Steve Jobs was quoted in his official biography saying that he "finally cracked the case" of an integrated TV. The new iTV (alleged name) is expected to be completely easy to use, seamlessly synced with other Apple's devices and with the iCloud. At the moment Apple with its $99 set-top box Apple TV seems to be doing very well, with 2.8 million units sold in 2011. We are constantly hearing rumors related to the expected Apple's product, its features, price, and release date. CLSA Group views Apple TV hardware as a 2013 event. According to the estimations of ITG Industry Investment Research, the new iTV set could increase the company’s market cap by 10%, or $60 billion. Apple, already the world’s most valuable company, has recently hit the $600 billion level. Analyst Peter Misek from Jefferies, a global securities and investment banking group, doesn't expect the device to be called iTV. He suggests the new television could be called "iPanel" which can reflect its potential as a hub for gaming, media and more. The iPanel name also follows the "iP" format of other Aplle's products, like the iPod, iPhone and the iPad. However, it is just a guess from the analyst. Misek expects that an Apple television will have a $1,250 average selling price. Content sharing and media streaming from Apple's devices. Obviously, we'll soon witness the appearance of a new smart TV from Apple that is going to bring new changes to the TV market. And, yes, Apple may win!